Scorpion's EXO-R410 shows us that you do not have to make compromises to meet your budget. The SNELL approved EXO-R410 comes with Scorpion's Advanced Polycarbonate Shell, emergency release cheekpads, and an anti-fog faceshield. 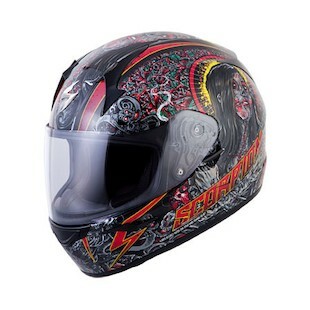 Price sensitive motorcyclists looking for a helmet that does it all for less pick the EXO-R410. Choosing the EXO-410 was easy, but choosing the graphic is much more difficult with the newly announced Departed, Split, and Underworld graphics. 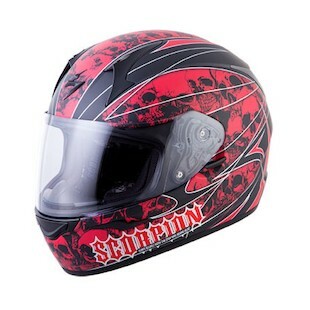 The Scorpion EX0-R410 Departed Helmet is straight out of a horror movie where your zombified ex-girlfriend comes back from the dead to exact revenge with her two revolvers. Apparently, she was really into westerns. 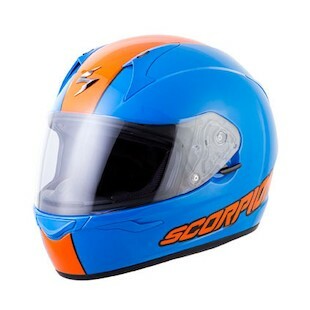 The Scorpion EXO-R410 Split Helmet is much happier with its bubbly Scorpion typeface and bright orange racing stripe down the center. The blue and orange combination harkens back to the Ford GT40 in Le Mans. After all that bubbly happiness, they take you back to the depths of hell with the Scorpion EXO-R410 Underworld Helmet. Just try to count how many skulls Scorpion crammed onto that helmet. Entry level does not have to mean less features. The EXO-410 is packed with high end features like a locking faceshield, aero-tuned vents, and anti-microbial internal liners. The addition of the Departed, Split, and Underworld graphics make the budget EXO-410 far from boring.